Michael is a veteran & a professional with over 25 years of experience in the music industry. Michael has toured as a drummer & played many of the U.S. nightclubs throughout the 70′ & 80’s, sharing the stage with groups such as Three Dog night, Blood Sweat Tears and the legendary late & great jazz drummer Buddy Rich. For the last 15 years, you might have seen Michael as a drummer or DJ at weddings and Bar/Bat Mitzvahs throughout the Washington DC and Baltimore Metro areas. Michael can provide a full range of services from full sound support at your wedding ceremony, multi music system set ups to custom dance floor and/or area lighting. He has performed at parties for AL Gore, Barbara Streisand, Nancy Kerrigan, Tom Clancy & many more. Michael has been a part of more than 1000 successful parties. As a DJ or Karaoke M.C., he brings years of experience, a song selection of over 13,000 tunes & the capability of playing percussion along with the music for that live, “snappy” edge. He can also give Latin and Ballroom dance instruction!! Michael is a natural when it comes to games and entertaining the kids. He comes to your party with a big smile, a back up sound system and a guarantee to make it a night to remember!! DJ Michael 13 seconds of "All I Do Is WIn"
Comments/Suggestions : DJ Michael is always a TREAT! We love the combo of that he and his friend present. Jessica and Sam’s wedding! You were wonderful! We enjoyed the music! You and your assistant were awesome! I will be happy to be a referral for you, if you wish to use my name. Thank you for making the evening seamless and worry-free. 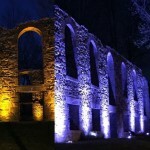 Comments/Suggestions : We had a wonderful wedding day and DJ Michael was wonderful! Michael was great!!! Thank you!! His playlist was perfect for the crowd!! We’ll set him up for this again next August. Comments/Suggestions : Michael did a great job and really hustled to get set up on time as we had a limited window. DJ Michael kept our guests dancing all night long! DJ Michael came highly recommended from a colleague who used to DJ for Entertainment Exchange in another life. The following compliments and comments from the guests at my daughter and son-in-law’s wedding say it all. DJ Michael picked wonderful music during the cocktail reception. His choices appealed to every age group from those who know who Frank Sinatra is or those who sing along to the catchy tunes of Andy Grammer’s “Good to Be Alive” or Train’s romantic song “Marry Me”. DJ Michael’s sound system and the way he mic’d the officiant and the groom made it possible for us to hear the ceremony all the way to the last row of seats despite the wind. It’s the first wedding where I was able to hear every word from the bride and groom. We even heard Dexter the dog groan as he laid down on the pavers during the vows. DJ Michael didn’t talk too much. I hate it when DJ’s at weddings talk more than they play music as if it’s about them and not about making sure the guests are notified about moments during the reception and keeping the dance floor full. I’ve never seen a dance floor that didn’t clear sometime during the reception, but tonight DJ Michael played such good music the guests never seemed to sit down. Thank you DJ Michael for making my daughter and son-in-law’s wedding day such a success because you prepared and know what to do behind the scenes so that the bride and groom and their guests can hear the ceremony, are serenaded with music appropriate for each part of the wedding reception and play the music that keeps everyone on the dance floor. You’re a true artist and consummate professional! I second Jonathan, definitely the best wedding yet 🙂 It was a wonderful set of vendors, the entire night seemed to run smoothly. Thank you very much for sharing the sneak peak, the pictures are gorgeous, can’t wait to see more:) They truly are such a great couple! Look forward to having you all back at Birkby! and Congratulations Carlin and Jason! have a fantastic honeymoon!! Great working with you all for the best wedding of the season we have had! We all were a great team and congrats to Carlin and Jason and enjoy the honeymoon. I hope to work with all the vendors in the future. Entertainment Exchange handled our string trio (String Theory), our DJ (Michael), and the venue lighting. ALL were pitch perfect from start to finish. Let’s start with String Theory…they were worth every penny. They provided an absolutely beautiful arrangement of our song – Jason Mraz’s “I Won’t Give up” for the wedding party entrances. It had people in tears. DJ Michael followed our minor direction to a T – giving us just the right feel for the dinner, that then morphed into current pop/dance music for the post-dinner dancing. But THE BEST part of working with Entertainment Exchange was the lighting they did in our venue. It was warm, romantic, theatrical, and perfect – turning the Carnegie Institution for Science into an autumnal wonderland! Our Entertainment Exchange Producer, Peter Lloyd, worked with us beautifully from the very start to the very end. We couldn’t have been happier with the results. Comments/Suggestions : We can’t say enough about Michael. This his is second time with us. When our second daughter was engaged we made sure we could have Michael again! He is knowledgeable, professional, and fun! He knows how to keep the party going. Michael truly made both our daughter’s weddings special. He has become a part of our family! Anyone who is lucky enough to have him will be very pleased. We recommend him highly. We found Michael through Entertainment Exchange which has a relationship with our wedding venue. We were a bit lost as to how to choose a DJ without seeing them work. Then we met Michael before finally committing and we knew we’d be in good hands. He is an experienced professional who caters to his audience: you want young and hip, he can do it; you want the classics, he knows exactly what to hit; and if you want him to pick everything he will play to the crowd. Michael dealt with a massive amount of requests we had ahead of time. Did an excellent job with the Intro’s, difficult name pronunciation, and MC’ing. He has fun without ever making himself the focal point of your big day. I can’t recommend Michael enough. In addition to DJ’ing the reception, he took care of sound and mics for our ceremony where we had an officiant, harpist, and singer. The sound came out great even amidst gale force winds. Thanks again. We had DJ Michael V for our wedding reception, and he did a fantastic job! He helped me orchestrate a surprise piano serenade for my wife, and did a great job as an MC keeping the reception moving at the right pace. Thanks Michael! 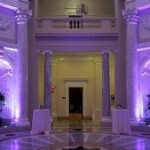 Michael V was a fantastic DJ for our wedding in Washington DC! We were very happy with his planning sessions on the phone. His website makes it so easy to create a playlist of songs that we wanted. He also gave us wonderful feedback and suggestions of when to play and not play certain songs. We strongly recommend DJ Michael V for your wedding!! Nobody does it better than Mikee V! Mike was an all-around pleasure to work with; professional, personable, classy, and has great taste in music of course. Our experience was 100% stress-free which was wonderful with the million other things to take care of before the wedding. He was also always quick to respond to emails and phone calls. Our entire evening was a tremendous success and the dance floor was full all night long. Thanks again Mike. 5 Stars! 5 Stars! 5 Stars! Michael was the absolute best! One of the main reasons I chose to work with Michael was because of the absolute professionalism his exudes. From our first meeting, Michael made me feel completely confident he would do a great job. He made me feel like I was his top priority, continuously touching base and making sure I knew that I could reach out if I needed anything. I put together a list of songs, but I had such genuine confidence in him that I did not feel the need to go song by song picking the exact order for our reception music. Michael was beyond EXCELLENT for our Wedding Day. Truly. We asked for country and lighter alternative music during cocktail hour, and it was perfect. And, as my mom describes it, “as the night went on, the music got better and better.” It was fabulous. Our night was a veryyyy warm evening in September, but that didn’t stop the dance floor from being packed the entire time, including myself and my new husband 🙂 I wanted a DJ who didn’t need to hear themselves talk on the microphone, and Michael respected my request, he spoke when it was necessary, and was very tasteful and poised. If you are looking for a DJ, take my word, use Michael Valenti! You will NOT be disappointed!! Not only was he a phenomenal DJ, he is a great person and I genuinely enjoyed working with him! Michael V is a gentleman, a scholar, and a PHENOMENAL DJ. I will recommend him to anyone and everyone. – Before our wedding, my wife and I used Michael’s “DJ Intelligence” account to design everything for our event from song choices, to timeline, to wedding party order… So many details (lol). This resource simplified everything for us. – I could reach Michael at anytime day or night. Zero communication issues. – Michael provided CRITICAL guidance as to my timeline and important song choices (i.e. First Dance, Father-Daughter Dance, Mother-Son Dance, etc.) I took every one of his recommendations into account. 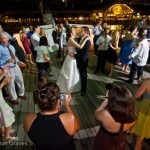 – Michael kept the night going from our entrance, through dinner, through the dance party with great music. There was never once an issue, an awkward moment, or a lull. Thanks so much for a night I will never forget, Michael. I’m so happy to now call you my friend!!!! Michael knows his stuff! He was amazing throughout the planning process and provided us with an extremely organized and easy to use system to select music and plan the reception. He allowed us to plan as little or as much as we wanted, from selecting the entire playlist to leaving it all in his hands. He has incredible knowledge about music right down to the beat rate of each song. His knowledge made transitions between songs seamless and selection of songs perfect to keep everyone up and dancing. He was extremely responsive via email or phone and had great suggestions whenever needed. The dance floor was packed the whole night from one-year-olds to 71-year-olds! 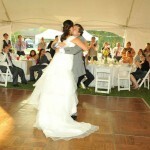 My husband and I had NEVER seen our parents dance and we couldn’t get them off the dance floor! Michael put everything he had into making the night perfect for us and reflected our personalities completely. He was even out on the dance floor dancing with us! He made our reception better than we could have ever imagined. People are still talking about the music at our reception. We would highly suggest Michael to anyone looking for a reception that all guests are sure to remember for years to come! Mike was an awesome DJ! He had our dance floor packed the entire night. I was hesitant at first for the amount of dance time I had allotted for my guests but he made certain everyone was up and dancing the entire time. The playlist he prepared included all of my “must play” selections and was a great variety of groups and type of music I wanted played. I would highly recommend him to other brides. He was worth every penny! I know every single 5 star review here speaks for itself. But I have to share the story of my wedding. Pretty much all of our friends, and especially the groom and I… Are not the ones to dance, anywhere. We don’t party much, and we are the type that usually just hang out at home on our computers. So as you could imagine, we worried about the state of the mood for our daytime wedding. The moment we talked to Michael for the first time though, we were so relieved. I still remember him telling us how he knows how busy and crazy everything will be for us, and that he’s got our back. And he wasn’t kidding. I had a vision for a particular series of ceremony music that I put together, and with just a quick explanation and sending him the songs, he NAILED it. Everyone couldn’t stop talking about how awesome the music was. And when it came to the reception, he seriously was a godsend. Imagine, with the awkward/shy series of friends, there was a point where everyone was on the dance floor having a blast. Seeing my mother-in-law dancing with my granddaughter was also priceless, and even brought tears to the family members’ eyes. It felt like a wedding day miracle. He even got on the dance floor himself and that just shot the mood up the roof! He also listened to every single request and even a foreign song we had dedicated to our mother he played at the perfect time. He’s a hero in a DJ disguise. If you are fortunate to have Michael Valenti as an option for your wedding, I’d recommend him with all my heart. Thank you, thank you, thank you! You did a tremendous job and we sincerely appreciate your diverse playlist, enthusiasm and professionalism. We’ve never had an event where people stayed to dance. They typically eat, pick up their auction items and run home. Kudos to you! I’m just miffed that I didn’t get to dance more. Happy New Year Michael! Thank you so much again, we really had a blast, and people have said that this party was the best ever! We’ll be in touch again soon I’m sure. We heard about Michael through a recommendation and couldn’t have been more thrilled with his performance. On our wedding day, his execution was absolutely flawless and he certainly did not have an easy task at hand. Because of the way our venue was structured (2941 Restaurant), Michael had to set up music equipment in three different spaces (ceremony space, dinner space, and cocktail / dancing space) in the span of an hour. For cocktail hour and during the reception, Michael did a great job of making the right announcements at the right time with the correct pronunciation of names. In addition, we had to move people between dinner and dancing spaces quite a few times, and Michael made sure to make these transitions very seamless. Most importantly, Michael kept the party going all night long! I couldn’t believe it, but everyone was dancing the whole night and having a blast. 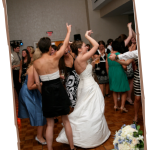 Our crowd was having so much fun that we decided to extend the reception by 30 minutes! To make sure the wedding day is as smooth as possible, Michael does a fair amount of preparation months before the actual event. We had originally booked Michael about 7-8 months before our wedding day and from the beginning, Michael was a true professional. In the early months, he took time to talk us through logistics, planning, and timing via multiple calls and emails. Picking our song lists were super easy via his DJ Intelligence technology, which allow you to easily preview and then create “must play” and “do not play” lists. All in all, my wife and I were thrilled with Michael’s level of service and his value is unbeatable. Most importantly, everyone had a great time and thought he did a good job. I even had a few of my friends (who will be getting married in the next year) ask for Michael’s contact information to inquire about him being the DJ for their weddings. Michael V was awesome to work with. He was available for discussion and suggestions via phone and email. He responded promptly and had great suggestions. We were running late the day of the event, but Michael adjusted as needed without needing to interrupt us during the festivities. He knew just what to do. He was professional and flexible as far as the play list as some guests did have requests. He was prepared and organized. Would recommend him to anyone! Thanks Michael!